It was almost 60 years ago to this very day that West Side Story opened at Broadway's Winter Garden Theatre. More than just a contemporary reimagining of Shakespeare's Romeo and Juliet, the show represented the combined creative talents of giants in the fields of music and theater — Leonard Bernstein, Stephen Sondheim, Arthur Laurents, Jerome Robbins — and, as quaint as its stylized take on gang rivalry might seem to us today, generated no small amount of controversy for depicting a seamier side of American life than some theatergoers thought necessary. "It was a trend-setting piece," says Lenny Bart, the Spokane Civic Theatre's artistic director. "It's probably, in my opinion, the greatest piece of American musical theater, period. And I think I would have a lot of people who would agree with me on that. The music is phenomenal and astounding." That doesn't mean it was an easy sell for its creators. "It was a challenge to get the piece produced in the first place by some of the strongest people in musical theater at the time, so you know that they were facing huge uphill challenges to get something that loosely uses Romeo and Juliet to make modern commentaries," says Bart. 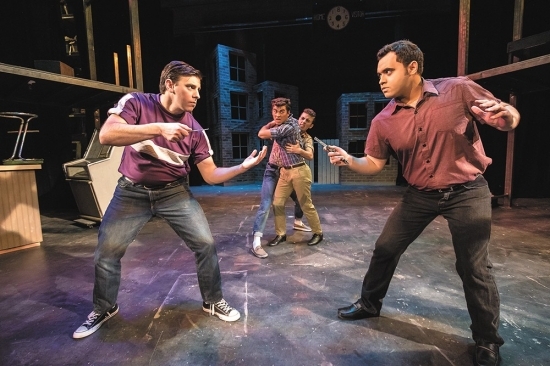 Though Bart is now directing a new production of West Side Story, he hasn't had the smoothest experience bringing it to the stage, either. It's been on his "bucket-list shows" for more than three decades, and it wasn't until he proposed having the musical launch the Civic's 71st season that he was finally given the green light. In the meantime, things have fallen into place, which has left him feeling more comfortable in terms of both his executive role within the theater and the production he's currently heading. Bart says that he's settled into the Civic's culture and gained vital "institutional knowledge of the organization" since being hired around this time last year, allowing him to concentrate more fully on "the thing I love most," directing. "This particular show is in very strong shape. We have a really incredible and functional set that Matt Egan has designed for us. Our choreographer, Angela Pierson, is really a good choice for this piece. And we have a lot of young and new performers in this show, our youngest being 14. The athleticism that they're bringing to the dances and the blocking, and the utilization of the set is very exciting and stimulating to watch," says Bart. In recent weeks, Henry McNulty has also been working alongside Bart full-time as the theater's resident music director.